I wrote a post awhile ago about free motion quilting and my Juki. I’m about a third of the way through quilting this quilt and I thought I’d give an update. I complained about quilting my mom’s quilt at a guild meeting in July. I got a lot of super helpful tips from other Juki owners. The biggest improvement happened after I switched thread. I jumped on the Aurifil bandwagon (I read too many quilting blogs!) and tried it and I don’t like it. The 50wt Mako cotton thread is really thin and didn’t work well for quilting. Given that, I probably should have used the 40wt for machine quilting. For this quilt, I am using a spool of Gutterman cotton quilting thread and I’m not having any problems (yet). 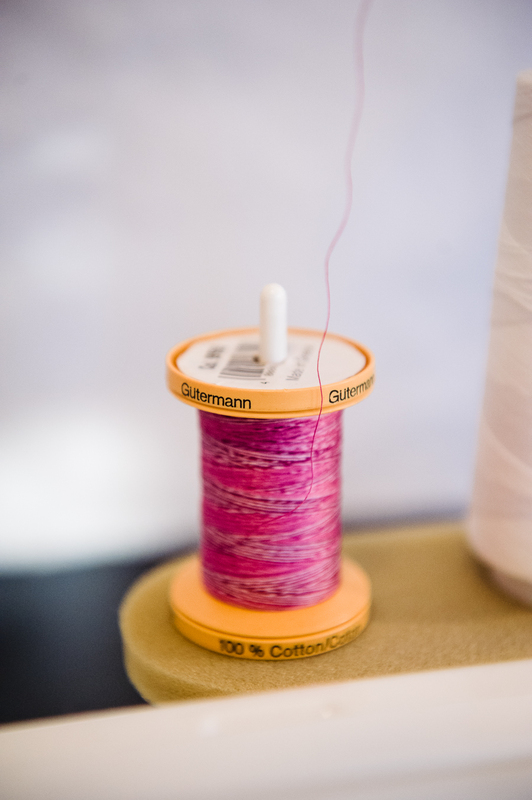 I do recognize that the type of needle is a factor, so consider that as well if you have trouble free motion quilting. For the record, I’ve been using Organ needles, and will continue to use them until I run out. Since I have around 200 Organ needles, that won’t be anytime soon. I happy to say that I’m quilting on the Juki is really great. I set the speed to about half, and then just push the pedal and go. For this quilt, I am using the Modern Art design on the plain blocks. I really like how it looks so far. In the 9 patch blocks, I’m doing a kind of echo quilt, joint, square corners kind of design. Pretty much just making it up as I go along. I work on a few blocks in the evenings, generally only quilting for about 20-30 minutes. Unlike quilting my other quilts, I changed my workspace set up – meaning, I don’t change to a specific ‘quilting’ set up. 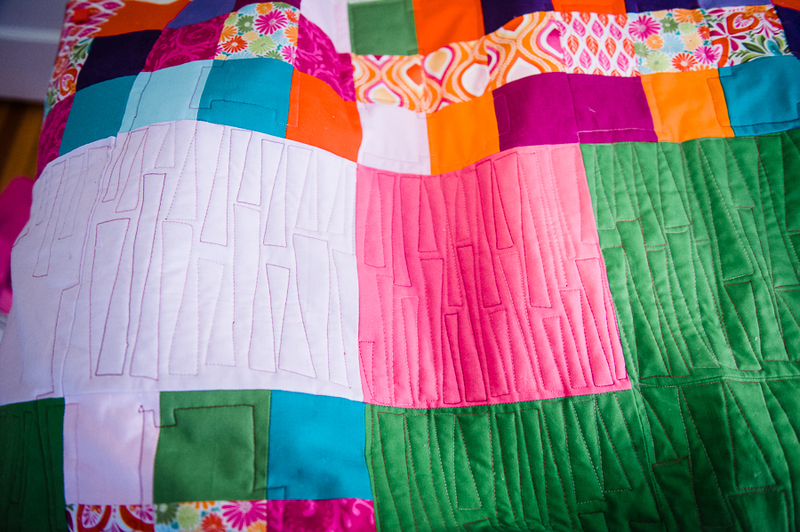 I bunch the quilt up on my lap, pile it up on the table and really only focus on the 8-inch square under the needles. I can’t tell you how much easier and less physically demanding this set up is for me compared to how I quilted my quilts before. And since I’m not moving furniture around and creating a hot mess, I feel like quilting. Its nice to be able to do about 3 minutes of set up before getting to work, and then spending another 3 minutes to put things back in place. I have a Juki too, but an older one without speed control. I’m seriously wishing I could upgrade to your machine. Mine has crazy speed control. The littlest pressure change and it can take off like a bat out of hell or slow down to a snail’s pace. Do you have that with yours when you don’t use the speed control?